8 hardy young athletes competed in the N.Ireland Youth Mountain Running Trial on Slieve Meelbeg today. They were competing for a place on the team heading to the Junior Home International to be held on the 17th September in Keswick, England. 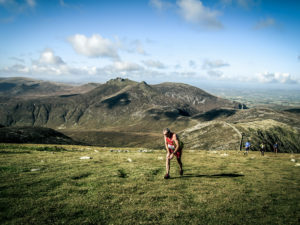 Starting approximately 10mins after the Senior race from the same location, their course took them up a zig zagged track and out onto the ridge heading for the summit of Meelbeg, a distance of 2.1km with approximately 400m of climbing. The course was muddy from the previous day’s rain, and covered in a heavy mist, that got progressively thicker as they approached the summit. Oisin Brennan lead the way, with Scott McKeag close behind. Oisin managed to pull clear as they approached the summit, finishing in a time of 17:44. I am told this would have placed him in the top 5 of the senior race at that point. Scott appeared out of the mist only 33 seconds later, showing he has lost none of the pace from his excellent placing in the World Cup, back in June. Third home was Jack O’Farrell with Ethan Dunn just behind in times of 19:51 and 19:53 respectively. Aaron Harrison completed the top 5 in a time of 20:53. Congratulations to all the lads on strong performances, particularly for not being put off by the tough conditions, nor getting lost in the mist! Thank-you so much to those registering the runners and to the marshals who braved some miserable conditions to make the trial a success. Final team selection will be announced in the coming days.